An unexpected journey awaits those who come to this place. 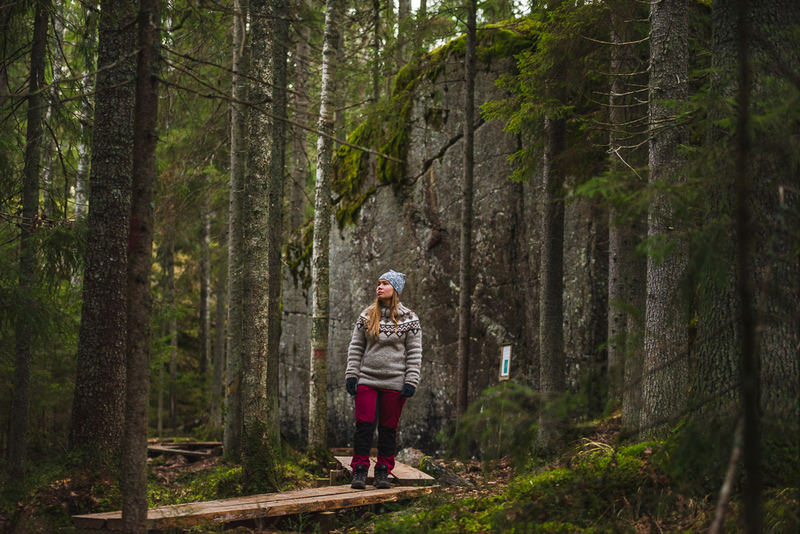 A fairy-tale forest exists above a section of the National Road 1, running from Helsinki to City of Turku. 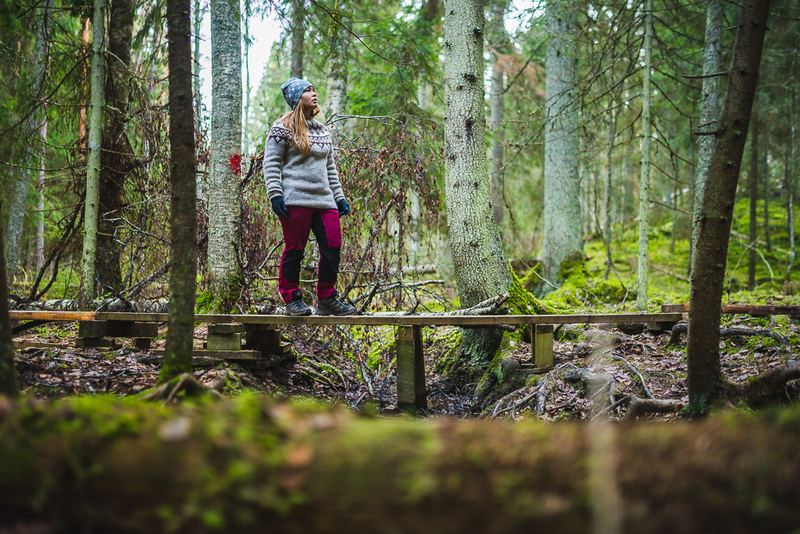 Karnaistenkorpi has a well-marked nature and story trail and lean-tos by the ponds. The trails look like figure 8, and you can choose whichever distance you wish to hike. There are two starting points for the trails that are equipped with outdoor toilets. They are marked in this map under the name “Paikoitus”. The address of the parking area is Suoniementaival 30, Lohja. A shorter trail of about 3.5 kilometres is available starting from the parking area next to the Kisakallio Sports Institute. The trail goes around two ponds and lean-tos and comes back to the starting point. 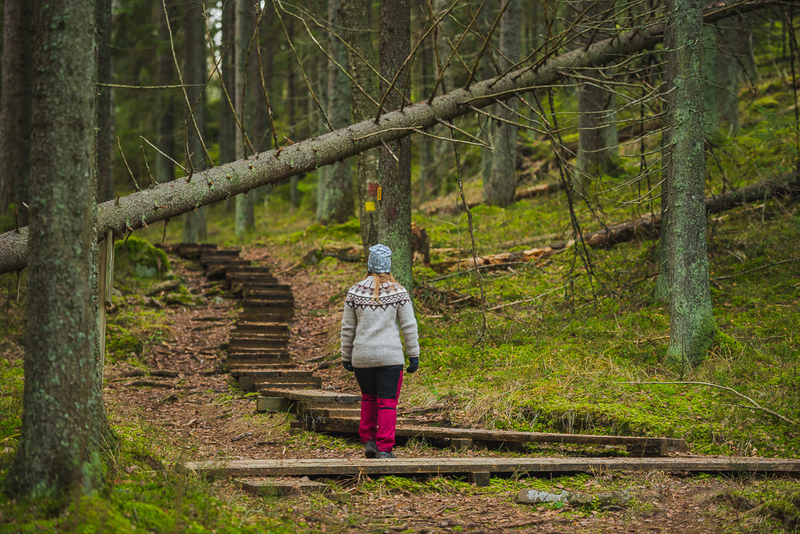 This trail is suitable for families and for those who wish to take things easy. The story trail begins also from this parking area. One of the many things that may come to you as a surprise is the silence. Although the motorway is close, it runs inside the bedrock which effectively blocks out the sounds of traffic. Nature is also quite special here: beauty everywhere and forest as from a fairy-tale. 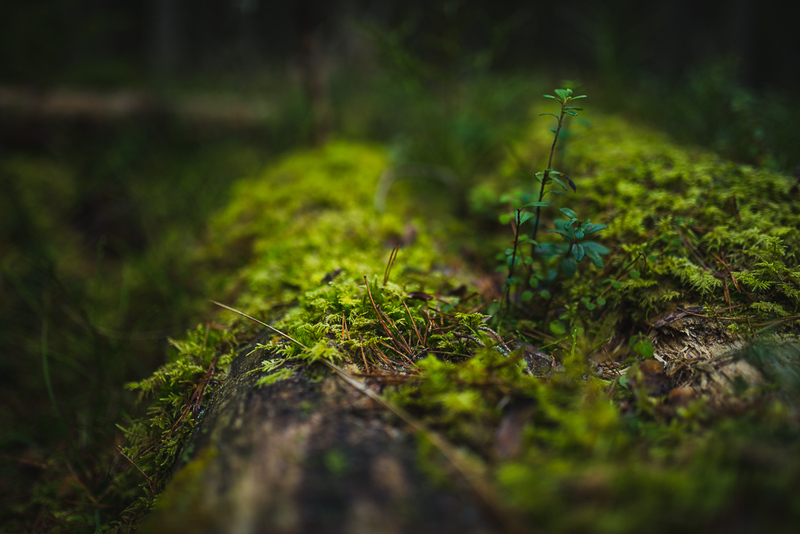 Soft green mosses and towering spruce trees make you feel you’re safe here. The story trail runs clockwise. It rapidly leads to the shore of a small pond. The bank is a little marshy. 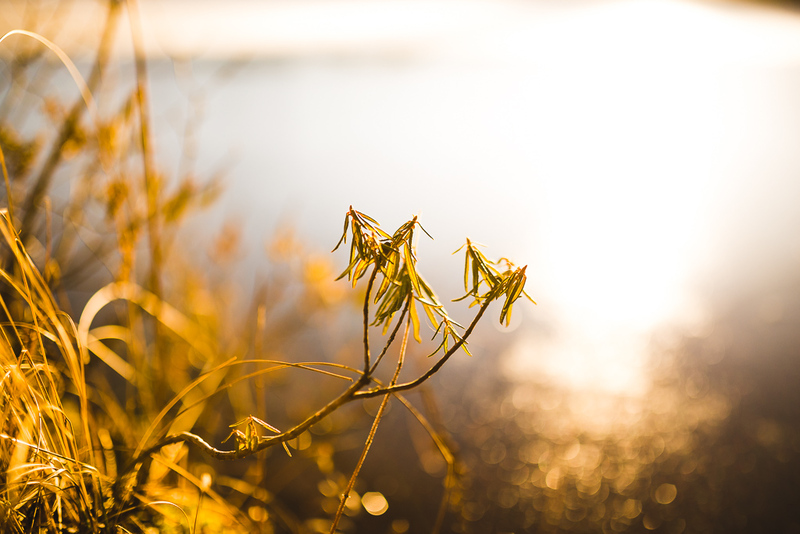 When we visited the place, the winter was on its way, and the pond was partly frozen. However, the sun was still warming us up nicely. We smelled smoke coming from somewhere and understood that there must be a lean-to nearby. Beautiful Labrador tea was growing by the pond. Labrador tea is a common plant on marshy areas, and when you rub the leaves of the plant on your fingers, the scent gets stronger. 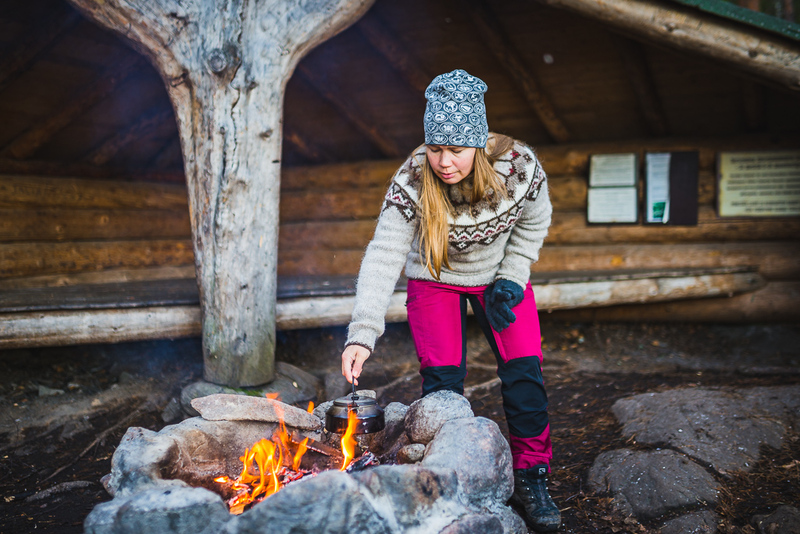 This is what Finland smells like. When we got to the lean-to, fire was going, and a father was teaching his son some wilderness skills. We sat down with them. We had picked up some delicacies from a bakery on our way to Karnaistenkorpi, and we also had a small coffee pot with us. As we were hungry, a lunch break was in order. 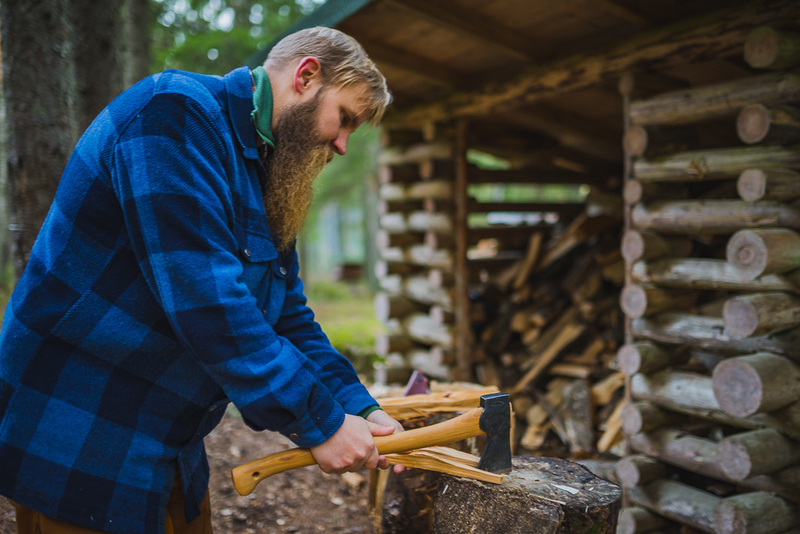 There is a wood shed near the lean-to, and the firewood is available for use. The firewood was a little damp, so I chopped it into smaller pieces to make it burn better. 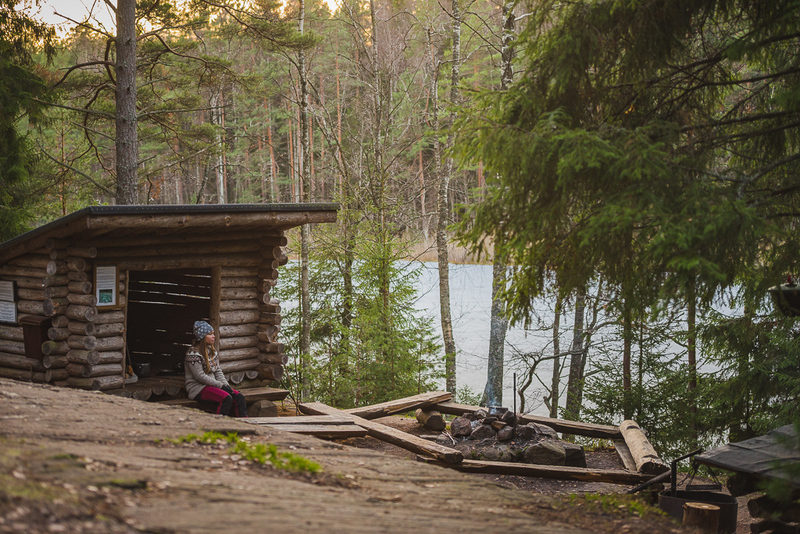 The lean-to is located on a very picturesque spot on top of a cliff by the Ahvenanlampi Pond. 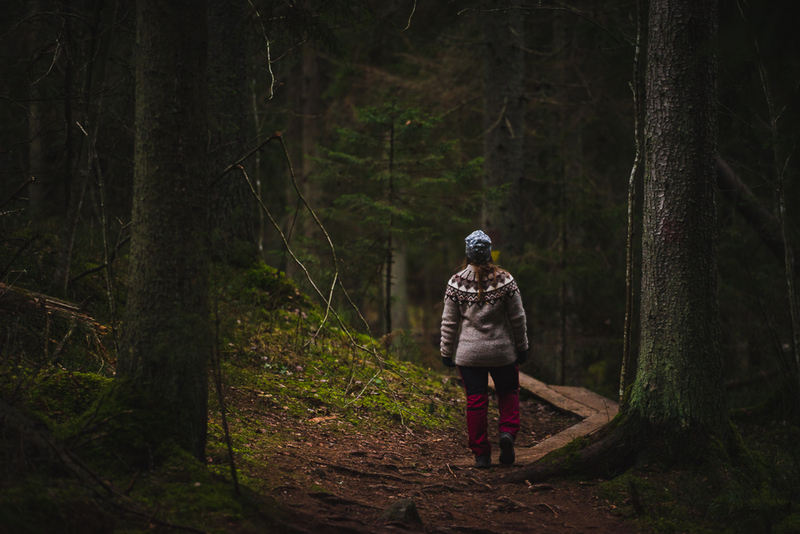 You need to step off the story trail a little to find the lean-to, but it’s still an easy task. We found a handy gridiron at the lean-to. 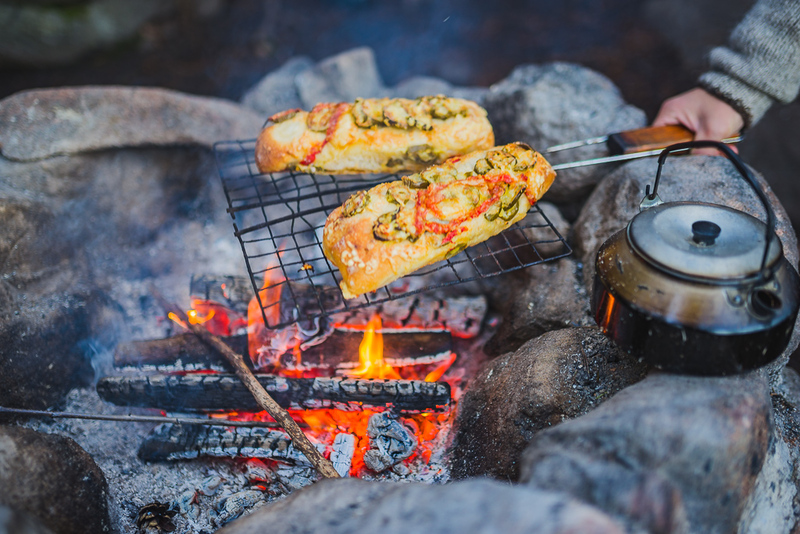 We put our paninis on the gridiron to warm them up over the fire, and the water for the coffee boiled in no time. Our little outdoor lunch by the fire was perfect! The father and his son went on with their hike. 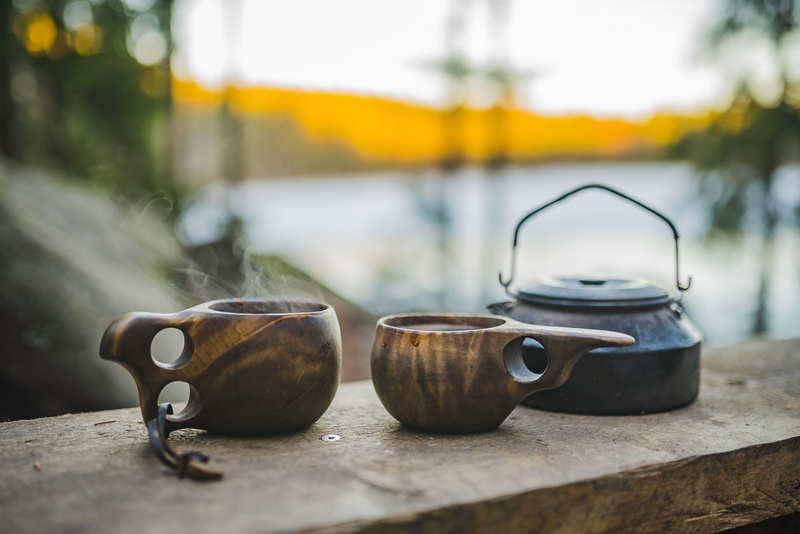 We stayed to enjoy our coffee in almost complete silence. You wouldn’t believe it if you didn’t know, but the biggest motorway in Finland runs right below this lean-to! We also continued our own journey along the story trail. There are 21 control points with information boards along the trail to offer lots of interesting information about local nature. The information boards are in Finnish. We made good way, and soon were at the lean-to at Sorvalampi Pond. This lean-to is also located on a pretty spot on top of a cliff. Both lean-tos (this and the previous one) are equipped with outdoor toilets and firewood sheds. Autumn days are not very long, and the dusk was already setting in. We stayed on for a little while longer to look at the last lights of the evening. 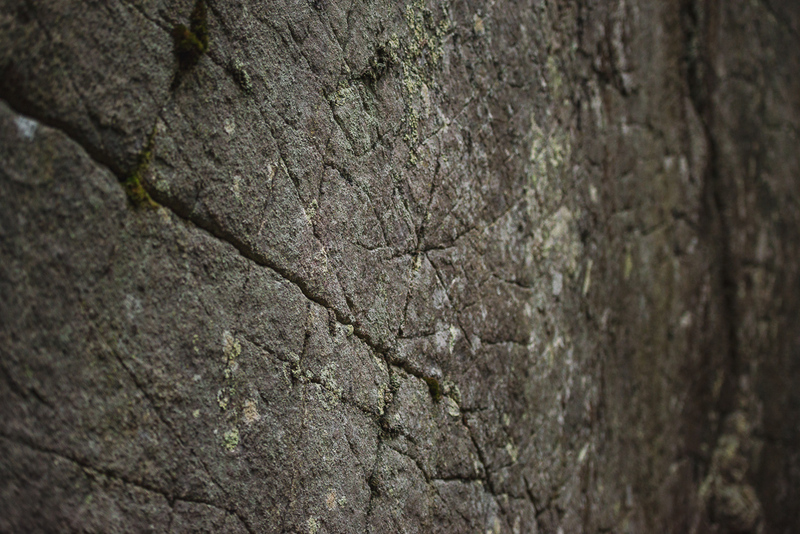 The ancient rocks of the region are covered in grooves that almost look like runes. 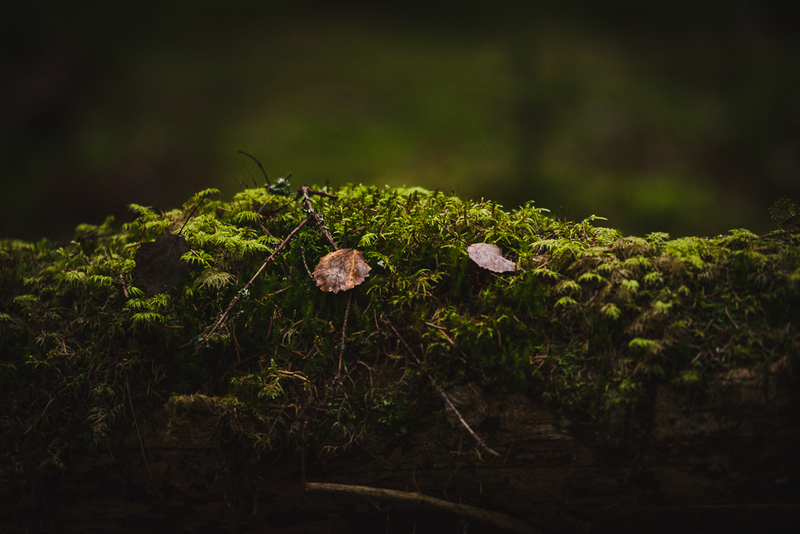 Green mosses and lichens grow on the rocks which makes them look fairytailish. 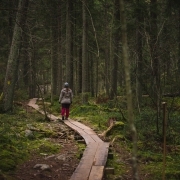 The trail runs on wooden causeways in many parts. Beautiful cliffs surround the trail on both sides. The causeways have recently been fixed so they are in good shape as the rest of the trail structures. Darkness fell gradually further and further into the forest. Luckily, we didn’t have much distance to cover anymore, so we just enjoyed the beautiful backwoods as long as there was light. My imagination got wings when the darkness settled in. In the dark everything looks different. Oh, I wish the trees could talk! These majestic spruce trees are way over a hundred years old. 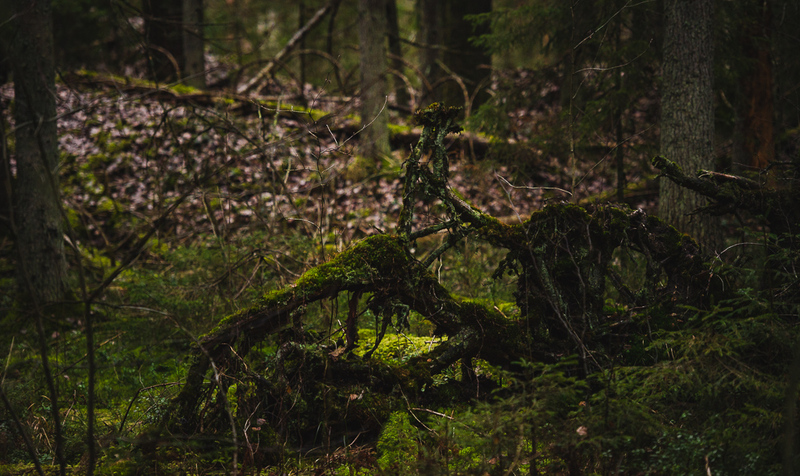 They have witnessed the cycle of life in the forest. 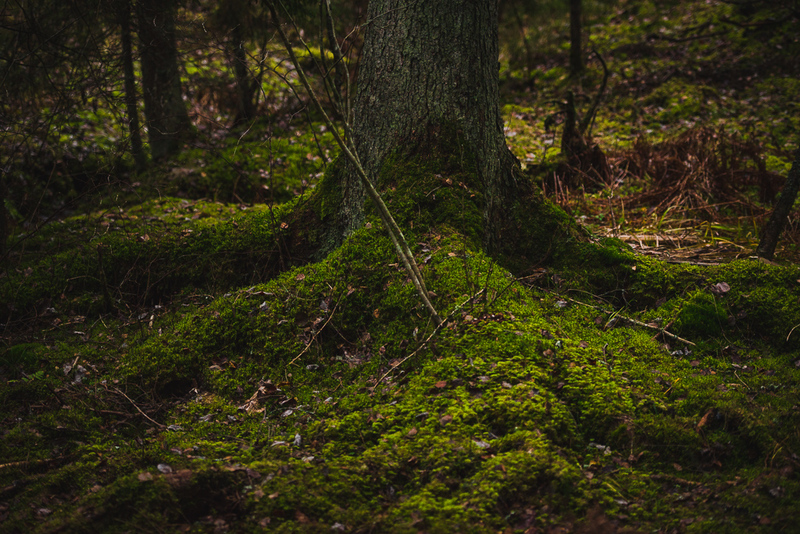 Their roots are strongly embedded in the ground, and they are not easily moved. Eventually, we had to leave these fairy-tale forests behind. We got into our car and drove home, but we will be back again someday – so magical was this place! Maybe next time we will sleep in the lean-to and listen what secrets the old spruce trees might share with us in the night. 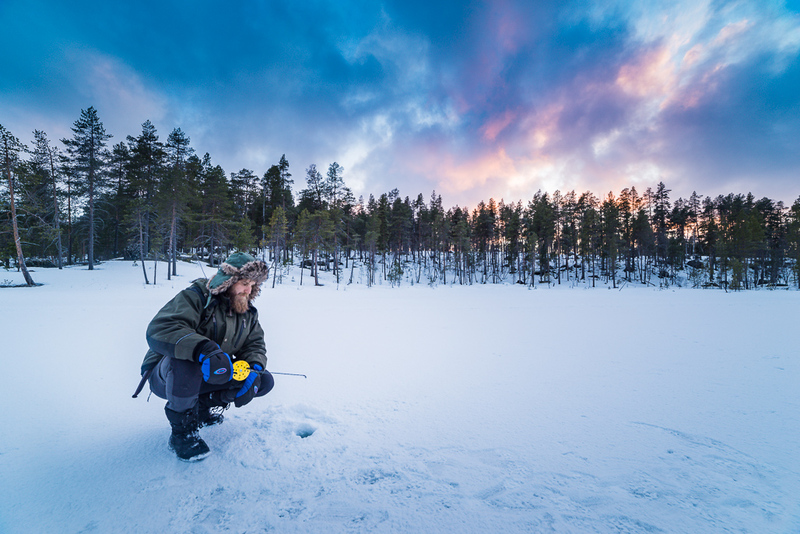 First impressions about ice fishing are usually negative. 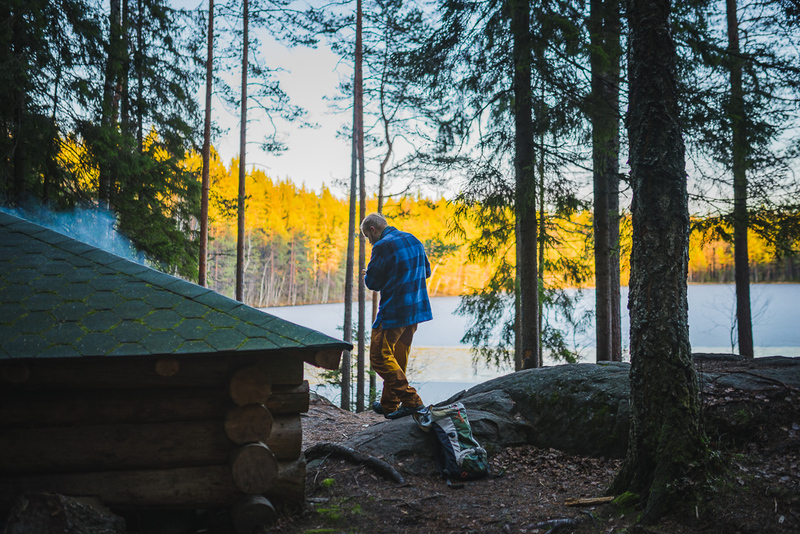 Even many Finns think it’s a cold and boring hobby. Actually it’s just the opposite. 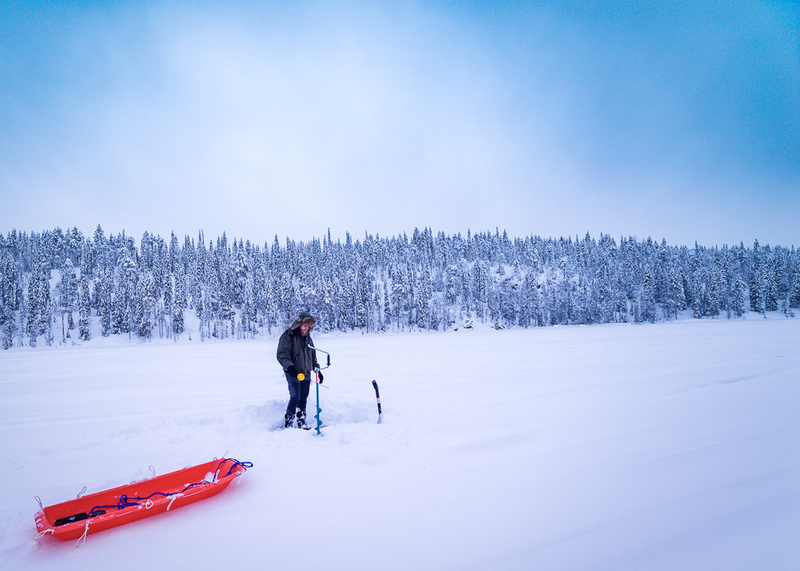 Imagine yourself walking or skiing on the ice of a frozen lake or sea. There might be dozens of meters of water below you. Only half a meter of ice is between you and the freezing cold water. I once heard somebody asking “is this really a lake?” It was a man who had never seen a frozen lake before. It’s sometimes difficult to understand that you are actually on the top of a large water pool. When you drill a hole to the ice and drop your ice fishing lure towards the bottom, you finally realize whats happening. 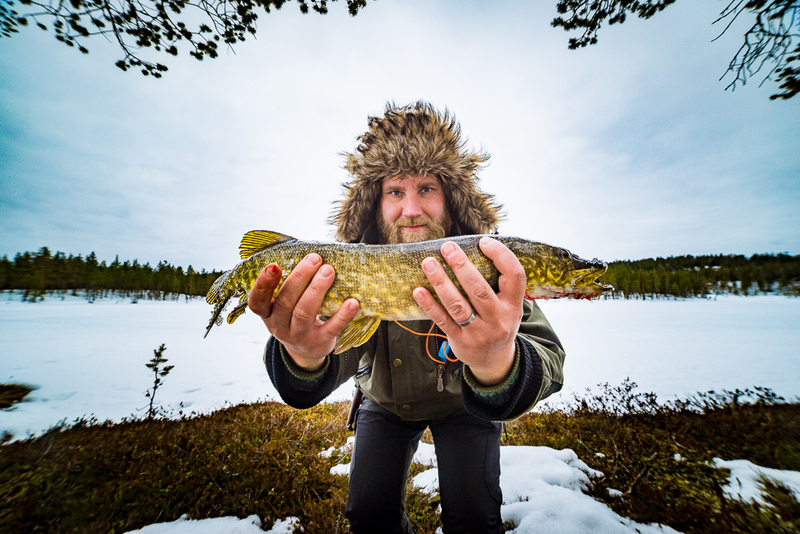 Ice fishing isn’t only about fishing or catching a fish. It’s also about enjoying the nature, peace and silence. 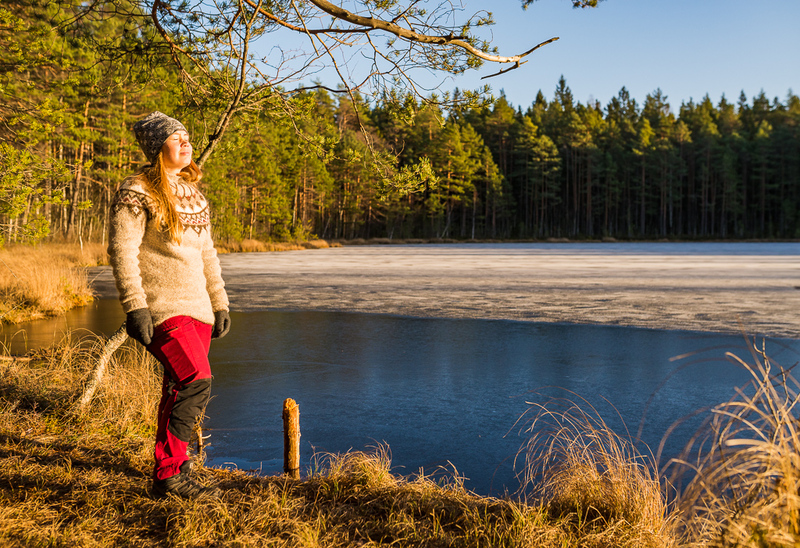 If you go outdoors at winter time, the easiest place to wander is on ice. When there is snow everywhere, the nature is so silent and peaceful. 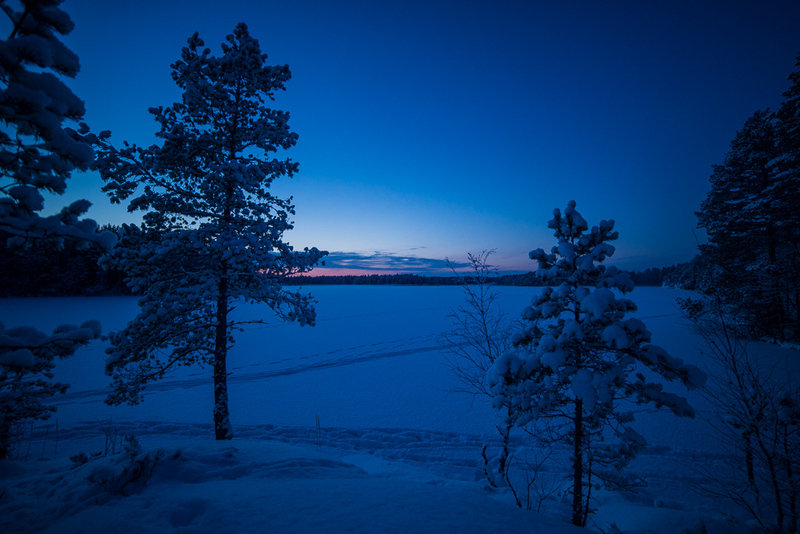 If you go walking on ice at a cloudless night and full moon, you don’t need any extra light source. Everything is changing into a fairy tale. 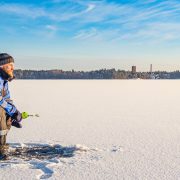 With the everyman’s right in Finland you can ice fish in lakes and sea areas for free (there are a few exceptions). We have a long sea coast line and almost 200 000 lakes. You can find a lot of pikes, perches and roaches in almost every lake. When you go more north, you can find a lot of graylings, trouts, salmons and some arctic chars also.